Even if you think you’ve been vaccinated for the measles, ask your doctor to check your immunization record to be sure. 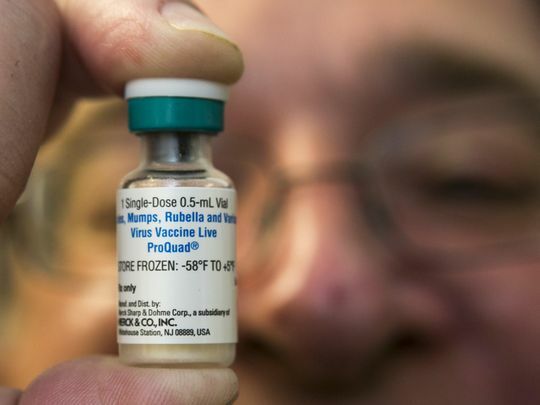 If you have proof you received two doses of the measles, mumps, rubella vaccine (MMR), you should still ask to have the antibodies in your blood checked, especially if you’ve been to one of the growing number of exposure sites in Michigan. Even if you had measles as a child or were born prior to 1957 and are considered immune by the U.S. Centers for Disease Control and Prevention, double check. And again, that’s especially true if you’ve been to a known exposure site. There’s a chance you’re not as safe as you think you are. “All these people walking around are vulnerable and don’t know it,” said Dr. Janet Snider, a Bingham Farms pediatrician. “We’re learning in the trenches because we don’t usually see measles,” which was pronounced eradicated in the United States in 2000 but is surging right now in pockets of the country. “For a lot of people who were born after 1957 but prior to 1989-1990, there was only one dose that was recommended at that time,” Stafford said. “A lot of people might feel they are up to date on their vaccines because their parents may say, ‘Oh, you’re up to date. We vaccinated you.’ But they’re not. “So that’s why we keep talking about knowing your status. Are there two doses documented somewhere with a doctor? Or Is it listed in MICR (Michigan Care Improvement Registry), which is the Michigan registration database for immunizations? If you don’t, then get vaccinated. That means that if 100 vaccinated people are exposed to measles, three may catch it, she said. “But if 100 unvaccinated people are exposed to measles, 90 would likely contract it. “People of all ages (should) check their vaccination status and make sure that they have had two documented MMRs after 1 year old, or they have had a blood test to confirm their immunity to measles. To read the full story here.